This article first appeared on the Job Talk blog. Read the original version here. 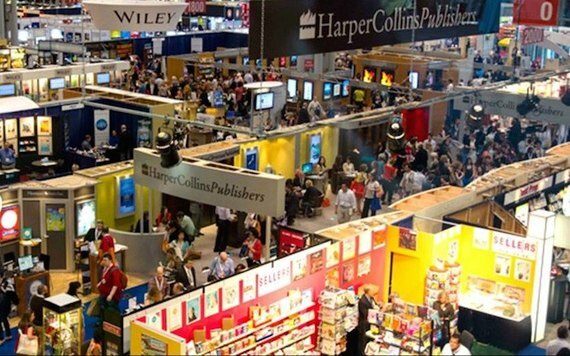 My first experience with the planet's largest book trade show, Book Expo America (BEA), held in Chicago in May, left me dazed and dazzled. Attended by 17,249 people and 1,000 exhibitors, authors, and publishers all clamoring for readers' shrinking attention, BEA brought home to me how daunting the process of sharing stories can actually be. Publishing a book today requires more than ambition. It means jumping into an ocean full of volumes, about 1.5 million every year, all clamoring to stay afloat in a vast market where most will drown. Since the good old days when the Oxford comma ruled and legacy publishers waged bidding wars over unknown authors with a good story (that's what happened with my first book, a socio-theological study of the American Christian Shakers), the field of book publishing has exploded just like social media: messy, mixed, and democratic with a small d.
Self-publish or choose 1 of 63,000 publishers? Even if you wanted to paddle against these odds, how would you choose whether to venture out on your own in self-publishing, or attempt to choose wisely among the 63,000 publishers in the U.S. alone? If I'd faced these statistics alone, I never would have left my kitchen office. However, the MY JOB book project has been, from conception to publication, a unifying force for its narrators and my family, coworkers, and publisher. MY JOB was conceived in collaboration (see the story of my friend Steve Schwartz brainstorming over a bowl of Thai noodles) and materialized through three years of conversations with real human beings about their labors and lives. Each chapter conveys the unique voice of the architect, musician, technologist, or banker who essentially coauthored the book with me. Moreover, My Job: Real People at Work Around the World was adopted as a project of the Skees Family Foundation, a compassionate clan of thirty people across three generations (who happen to be my family) hoping to use this book to broadcast the voices of unsung working heroes and raise funds for job-creation programs to end poverty. Then we began to build the MY JOB "dream team," with talented people from Boston to Green Bay to New York. Our virtual team got to be physically together for a couple of days in Chicago at BEA, for the first time. I met my publisher, Tracy Ertl, in person and I was delighted to find that she was every bit the kind, driven, and determined businesswoman I had gotten to know through conference calls and emails. Tracy's company, TitleTown, publishes stories of survival -- soon to include those of our narrators in the MY JOB book! Petite and sweet, she has the spirit of a fighter. Our amazing project manager Andrea Atkinson and I met with Tracy and the rest of our publishing team, which included the staff of Midpoint Trade and Distribution, who will be distributing MY JOB to booksellers around the country (and hopefully beyond!). Eric Kampmann, CEO of Midpoint and genuinely kind man who has supported us from the beginning. The meetings were highly educational. We learned how long a person looks at a book cover before making a purchasing decision (between 5-30 seconds), what a publisher looks for in an author (great content and the capacity to promote it), and how to create a pre-order campaign (coming on July 15 -- see here for more information). We shared deep-dish pizza with another TitleTown author, child prodigy Emily Rose Ross, who's working on her first young-adult novel Blue's Prophecy. We shared cabs with authors from radically different genres than ours -- raven-haired Mylo Carbia, queen of horror fiction, and soft-spoken Angela Thompson Howell, author of a book on meditation. We met a taxi driver with a Filipino accent who strained to see over the steering wheel and sway away from head-on collisions while she regaled us with her own unpublished story of how she single-handedly handed over Osama Bin Laden to the CIA. And our last sweet night in ChiTown, we loaded into a banged-up van with no suspension or seat belts to jolt across the entire city span for plates of the best rib-eye steaks and russet potatoes either side of the Mississippi. Traveling across the country to spend days packed in a warehouse jammed with signs and stimuli, reverberating with sounds of people clamoring for attention, is the last way this introverted author would ever choose to spend half a week. Yet the payoff was the chance to see how capable and creative our publishing and marketing team members are, and how excited they are to read the stories of MY JOB. Amazon sells over 1 million e-books every day, most from small and indie publishers, according to the 2016 Author Earnings Report. The U.S. has the largest publishing industry in the world (26 percent), bringing in $29 billion a year, according to the Association of American Publishers and Statista. As Sir Tim Berners-Lee, credited with inventing the World Wide Web, told Publishers Weekly in a keynote address on the future of publishing, "There is a universality on the web. It can be used for any genre. You can browse. It's flexible... you're only limited by your own creativity." If the MY JOB book can reach these numbers for audience and revenues, we can create serious impact with conversations about jobs and programs to build more of them. I think we'll not only stay afloat, we'll sail this book to places and people beyond any horizon we can currently perceive -- because we have each other onboard. Photograph courtesy of NewCity Lit.